At the end of 2013, Kenya witnessed an intense vetting process of police commissioners. Whether one believes the process was successful or flawed, we all collectively agree it was quite intense, difficult questions were raised and in certain instances, several skeletons came crashing out of the various closets we chose to look in. The Kenyan Explorer: Would you have me believe that based on that one experience you are fit to take on a 2 month trip? The Andes is not Mt. Longonot. Is it not also true that on that same day you proceeded to get soaked in sweat and did not have the decency to hide it? The Kenyan Explorer: Hush! Are you trying to cast blame on your fellow contenders? The Kenyan Explorer: Moving on! I am done with you white shirt! Brown socks, it states here that you have a thread count of 1000. Could you explain to all those present, how you came to amass such a high thread count? The Kenyan Explorer: Really? It states here that you started out at your previous position with a thread count of 100. The Kenyan Explorer: So, the rumors are true. Did you or did you not earn your wealth by sabotaging cream and black socks? The Kenyan Explorer: From what we have heard, you made a job out of destroying your peers and taking on their thread count! You are a traitor! "Super pretty bra with the metal wire that occasionally pokes the wearer": I have served for decades in this position and there has never been any issues raised against me. In the past years, though seeds of discontent have been sown by my enemies. In particular I will point out "Super ugly bra that offers maximum support", "Super pretty bra that offers no support" and "push up bra of unknown comfort levels". These newcomers have come in to usurp my position. They know I have served well. The Kenyan Explorer: We do not need this drama. Moving on to the next. "Holey sock", what are you doing here? Holey sock: A lot of negative things have been said about me, but I want to let you know that this wardrobe was built on my sweat. I was here when the closet was full of threadbare shirts. I have earned these holes. The Kenyan Explorer: This job requires a sock that can stand both high and low temperatures and effectively protect the wearer. Are we to believe that you are up to this job? Holey sock: I believe I have. My years of experience make me perfect for this job. My holes also do not prevent me from doing a great job. At the last review, there were only two major holes, and they are at the unimportant toes. I also represent an under-represented group. Red mid-calf socks with my type of experience are in short supply. (Angry voices from the crowd): Did you hear her? She thinks we are not classy? She thinks us we are for being worn at the bar, and she is the one for dinners? Pretty silk top: Yes, as I was saying before this riff raff jumped in, I am the perfect item to carry with you for those lovely dinners, exquisite parties and so on. The Kenyan Explorer: Would you have us believe that the stories are not true? Is it not true that you do not really work well with the other commissioners? That you are always demanding more? Did you not once say, "I cannot go to work without being ironed?" Pretty silk top: That was taken out of context. I was just saying that I need different terms to work well. (Angry voices from the crowd): Drama queen! Drama queen! Pretty silk top: (shouting): Can you bunch of torn, tattered, wrinkled clothes shut up! The Kenyan Explorer: We cannot have this. Whoever comes on this trip has to be a team player. We cannot have items that need preferential treatment. On this trip, "all clothes are created equal and none is more equal than the others." Lipstick and nail polish: I think we speak for our fellow comrades - the other lipsticks and nail polishes - when we say that we are the single most important item for this trip. The Kenyan Explorer: I agree with you. Let me put you in the backpack right now. After my late night at the hostel hearing of people's travel adventures, I planned to go on a free city tour the next day at 3pm. I could not believe it when I woke up at 2pm and realized I was very likely going to miss the tour. I jumped out of bed, showered quickly, possibly only oiled visible body parts (hands, legs etc) and sped off. I was extremely hungry, but because of foolishly waking up late, I had no time to eat and had to go for a 3 hour walking tour on an empty stomach. The tour was great in that they told us a lot about modern Valparaiso - artsy town, large port, UNESCO World Heritage site etc, but the tour was severely lacking in historical information. I love history and learning about different countries' past. I was hoping to hear about dreaded former dictator Augusto Pinochet. I wanted to hear about the Chicago boys - a group of US educated Chilean economists who in the 70s and 80s were responsible for free market policies that are lauded for the positive economic impact in Chile. Unfortunately we didn't get to hear about any such things. The tour was useful though in many ways - I got to see a lot of Valparaiso in a short time. We went to a place that sells 60 types of empanadas. I stuffed my face given how hungry I was. We used a few of the town elevators - really ancient but interesting elevators. We went to the port, walked up and down crazy hills. I felt energized. When I got to my hostel I actually walked up the hill. It was exerting, but not too bad given altitude was not an issue. If this had been a hill in Bolivia, I would probably have given up the ghost after 5 minutes. I got to the hostel and sat on the balcony with my hostel mates watching the sun set. We decided we were going out that night. I always do stupid things like that when I have an early morning bus/plane/train. It's some sort of self sabotage thing. We had dinner and drinks at the hostel then went out to party. We walked around in circles for an hour or so, finally gave up on finding the specific club we were looking for and just went into the first bar we saw. We found a place that sold "Terremotos." "Terremotos" require a paragraph of their own. It is Chile's national drink and translated to "earthquake" mostly because of what it looks like, but it is might also be a forewarning for what your tummy will feel like after drinking this. It is served either in a half liter or liter cup and is sweet white wine with pineapple icecream. It is actually quite sweet, which is why I would say it is dangerous - so sweet that you don't realize how much you have had. As we drank our terremotos we told horror stories. I'm not quite sure why. I really struggled in the morning to wake up by 6am to catch my morning bus to Mendoza in Argentina. Aaaaaaaah Argentina! I will enjoy telling you about my time there in my future blog entries. I am writing this from the airport in Sao Paolo at 5:30am. I am here on transit from Bahia to my Peru flight. My flight left Bahia around 9:30pm. There were a few mishaps during the day that made me nervous I would miss my flight. I had been told that the bus to the airport would take one hour, but it ended up taking two. I made it to the airport just in time. For some strange reason my backpack now weighs 17.2 kg, and I left Nairobi when it was 14.5kg....Is someone stashing drugs in my bag? Who knows? Anyway, the flight was uneventful. It was 2.5 hours and I was lucky that the airline lady in Bahia told me to get my bag in Sao Paolo and check it in again. I had assumed that my bag was checked in all the way to Cusco, Peru. I got to Sao Paolo at midnight and wanted to immediately check in for my 6am flight to Lima, Peru, but there was no one at the counter. It turned out to be good luck though cause I got a chance to change out of my summer clothing. The AC is really really high at the airport. I am now in jeans, a top, heavy sweater and a scarf...Around 3:30am I went to the counter to check in and that's when the drama started. In Kenya I had been told that the only visas I could apply for were Brazil, Chile and Argentina - because the rest of the countries I was going to don't have embassies in Kenya. I made various calls and was notified that for the rest of the countries, I would be easily able to get a visa on arrival. When I got to the counter, they asked me for my Peruvian visa and I explained my situation. On their end however though, the information they have says that a Kenyan citizen needs to have a visa in advance. They had to cancel my ticket, and I can't get on the flight to Peru. Obviously by this point, I am beginning to stress out. What will I do? I can't stay in Sao Paolo indefinitely. I need to leave Brazil - it's getting too expensive. Will I have to buy another ticket? Oh, gosh, how much? I went over to the airline office and I almost hugged the woman when she told me I can change my flight for one to Bolivia that leaves tomorrow. I don't even mind the 10 hour layover. The fact that I will not be charged for a new flight was enough to make me break into song and dance. So, for now I am siting at the airport awaiting 8am, when she can hopefully be able to issue me my ticket. After this long drama, I feel like treating myself and staying in a hotel close to the airport....if the prices are not too crazy, that is. Anyway if all works out I am off to Bolivia - which was meant to be my destination after Peru, and where I can definitely get a visa on arrival, and hopefully find the Peruvian embassy and apply for a visa there - fingers crossed! 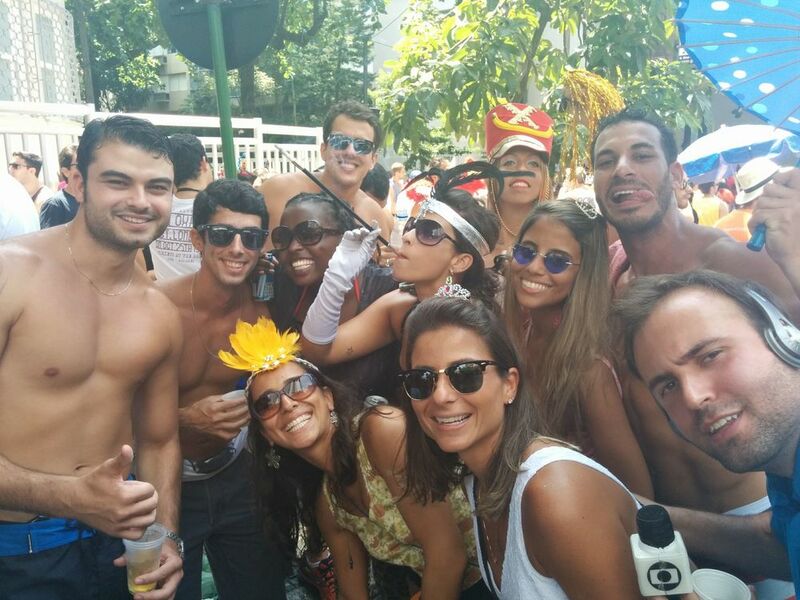 Jumping back to my last days of Carnival in Rio, before I left for Bahia....I can only refer to it as the blur. 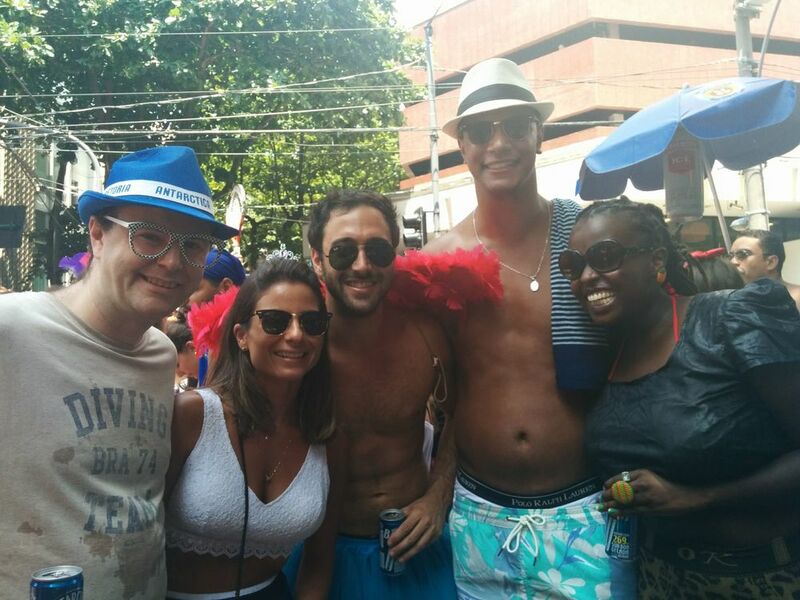 As evidenced in my post on the first day of carnival in Rio, these people go hard.....Waking up early, not really eating, drinking way too many beers, walking for miles as you follow the large trucks and the music....it was chaotic. I still have no idea why the trucks have to move. That part was annoying. Why can't the party just stay stagnant.....all that uneccessary exercise in that hectic crowd. So on the second day of Carnival, we left the house at 9am. We went to different Carnival parties for a few hours. After that my friend, his girlfriend and I decided to go to the beach. It's a bit of a sucky story. As I mentioned, you can't really go for Carnival with a bag. You have to store everything on your self. The first day I had put my money in a certain place, and when I got home I kind of forgot about it until it fell out. I thought to myself, "Oh! Bad idea. That is how you will lose it at Carnival." I moved the money elsewhere. The new location though also housed my phone. I got nervous that if I pulled out my phone to take a picture, I might drop my money. Finally I moved the money to my sock. I thought to myself, "When will I ever have to take off my socks at Carnival" When we got close to the beach, we obviously took off our shoes and socks. I only realized the error of my ways when I was already at the beach. I retraced my steps and frantically searched for the money I had dropped, but of course it was long gone.....sigh....stupid! After all this drama, it was an easy decision to buy a flight ticket online....which I also needed to fill in loads of information for, but that at least worked also for internationals. It was Sunday night, and my ticket was booked for Tuesday morning. I knew I had to go hard on Monday. Monday we left the house at 10am for the Carnival parties. I was very ambitious in the whole going hard thing.....I have patchy memories of dancing, drinking, taking pictures, dancing, drinking, taking pictures.....rotate. We all got home at 7pm.....The night has to end early when you start partying at 10am. I got home and started panicking "Oh gosh! I need to be at the airport at 6am. I haven't packed. I can't pack in this state.....I think I will oversleep and miss my flight." My friend is a real sweetheart. He packed my bags as I kept on micromanaging him in between the few bouts of consciousness I had. "Oh! Don't forget my shoes!" "Did you check under the bed?" My poor poor friend. I really do owe it to him that I made it to my flight.....that was a poor state I was in on that Monday night. The one issue that kept on disturbing me in Rio was the thought of "Where are all the black people?" Brazil is the country that has the largest population of black people - second only to Nigeria. I had seen a few black people during Carnival but very few among the revellers. There were lots of black people selling beer to the crowds, lots of black people picking up trash, lots of black people selling souvenirs, but very few black people enjoying carnival. 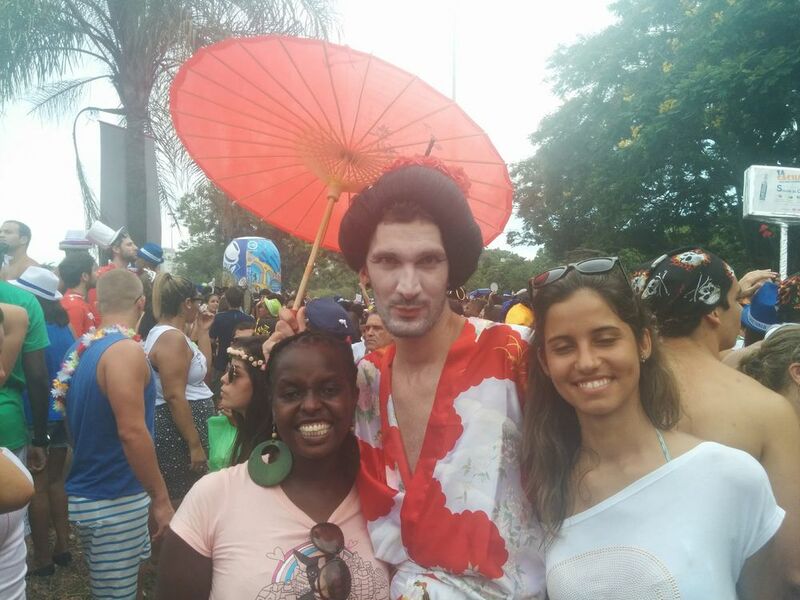 I asked my friend about the lack of black people, and he agreed that race issues are still a major problem in Brazil. It really felt sad to see this form of economic slavery. He told me a lot of black people in Rio live in the favelas. The situation reminded me of one time I went to remote parts of Tennessee and Mississipi. It felt so depressing to see that even though there were some really beautiful places, black people were on the periphery. Nice restaurants - no black patrons, just black waiters. Nice hotels - black cleaners..
Brazil really is a place that makes me reflect a lot on race. It's hard not to think about it - especially when here in Bahia, which was the entry point for over 30% of all the slaves that were taken from Africa.....Anyway, will write more later. Wow! That was a trip and a half. Who knew that my flight from Dubai to Rio would be 14.5 hours long? I really should know my geography better. So I left Nairobi at 11:30pm on Monday night and got to Dubai at 5:30am. It was a quick flight - around 4.5 hours. I left Dubai at 7:30am and knew I was getting to Rio at 2:30pm local time. I kind of forgot to look at the time difference:-) I got on the plane and I thought I heard them say 4.5 hours and I thought, "hmmmm, that's quick." Until I actually looked at the screen and saw 14.5 hours. My flight from Nairobi to Dubai was nice and quite uneventul. I decided to watch the Stephen King horror movie whose main character my Government name came from "Carrie." Heee. Heeee. Just kidding. I am named Carrie after my grandmother who was given the name by some missionaries back in the day. My stopover in Dubai was quite short. I remember getting to the gate for the Rio flight and thinking "Oh snap. Everyone here is speaking Portuguese. Maybe I really need to know some for Brazil." The only non-Portuguese language I heard at the lounge was either Punjabi or Gujirati. Not like I understood a word, but I took comfort in the fact that it was a familiar language. There was even a guy in Nigerian attire speaking in Portuguese. I later on confirmed that he was infact Nigerian when we were checking in and I saw his green passport. There were also a lot of Chinese people on the flight. Perhaps they were going on to Buenos Aires via Rio (our flight's final destination was Buenos Aires.) I asked my hosts about the large number of Chinese travelers on the plane, and they said there isn't a significant number of Chinese people in Rio......hence my conclusion they were going on to Argentina. That 14.5 hour flight was the most fascinating flight ever. We left Dubai at 7:30am and for the next 14.5 hours every time I looked out of the window, the sun was still extremely bright. I am sure the directions the pilot has to Rio are "keep flying into the sun until you see the Jesus statue, then dip down and land......" It was so sunny at some point that we were all asked to pull down the blinds for at least 7 hours of the flight. Every time I peeked out of the blinds, I could imagine how vampires feel. "Oh no, the bright lights! Aaaaaaaaaaaargghhhhh, I'm melting........!" The other strange thing about that flight was that we were only fed a real meal towards the last one hour of the flight. From the beginning we were served a light breakfast, then a light snack (veggie pizza), then some cookies.....At some point the African in me was about to cause some drama. "Just because time is standing still given our longitudinal motion, is no reason to stiff me out of a proper hot meal." Finally 12.5 hours into the flight we were served lunch. Amen. Getting through customs in Rio was easy. The tricky part was all the stuff I needed to do at the airport after that - change money, buy a sim card, get a taxi to take me to my friend's place. Everyone spoke to me in Portuguese and I tried to do my best with hand signals. Due to language barriers, I didn't even realize there was a USD 15 commission for any currency exchange in the airport. On getting to my friend's place I was warmly welcomed by his landlady and landlord with hugs, kisses and watermelon slices. Love it! Half an hour after my arrival, they asked if I wanted to go to the beach. That's a no-brainer for me. Jetlag can wait. We went to the beach then met up with my friend for dinner and drinks. It was a lovely night. 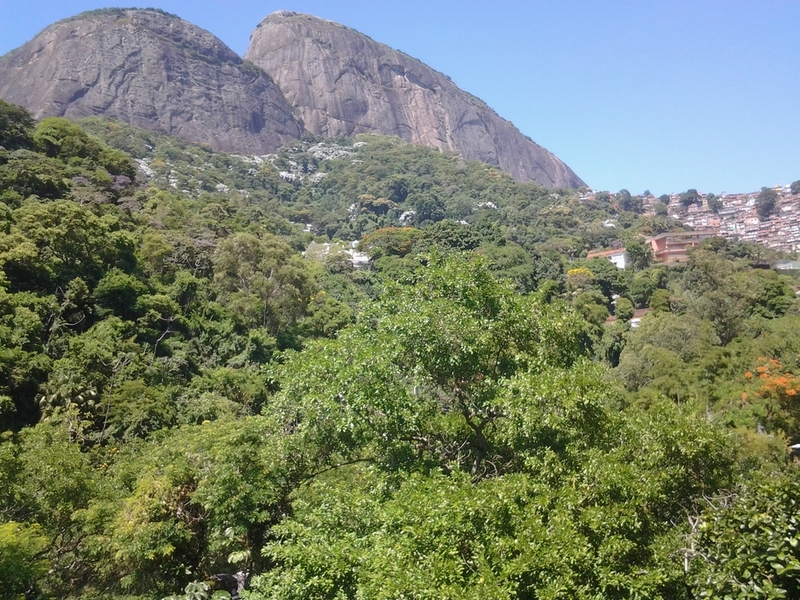 I slept by 11:30pm and woke up today at 9:30am ready to discover Rio! I am off to the Jesus statue today then will head to the beach! Excitement! !